Chase Kemberling, an energetic six-year-old with a full head of tousled, wavy hair intently studied the way the light reflected off of a glass podium, pausing now and then to snuggle his small stuffed dog and affectionately nibble on its tail. Meanwhile, Chase’s mother, 2016 Hope Gala Family Speaker for the Kemberling Family, told the story of his battle with Burkitt’s Lymphoma, a very aggressive and fast growing cancer. He paid little attention to the story as he attempted to balance the little dog on his mother’s head. Hundreds of people delightfully cheered his efforts when he finally succeeded. “This January 16th, we celebrated two years of in remission for Chase,” explained his mother. When he heard the word remission, he jumped up and down, apparently paying attention to the story after all. Hope Gala is a black-tie-optional event that supports the fundraising efforts of Penn State Dance Marathon, also known a THON. The largest student-run philanthropic institution in the world, THON is on a mission to conquer childhood cancer by supporting the Four Diamonds Fund, who assist children treated at Penn State Hershey Children’s Hospital and their families through superior care, comprehensive support, and innovative research. THON is the largest contributor to the Four Diamonds Fund. Gia Kornet Jones, daughter of Fabra-Cleen’s owner, Brian Kornet, first became involved with THON and Four Diamonds as a student at Penn State and then later continued to participate as an alumni when a group of Penn State alum established a year round series of fundraising events culminating in The Hope Gala. 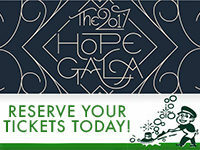 Tickets for the 2017 Hope Gala went on sale Wednesday, November 2nd. Reserve your tickets today and share this post with your friends to help Fabra-Cleen promote Gia’s efforts to make the big event, taking place at Gotham Hall in March next year, a huge success.